From August 2017 to September 2017, more than 700,000 people from the Rohingya ethnic minority fled Myanmar following terrible violence. What happened to them a year later? 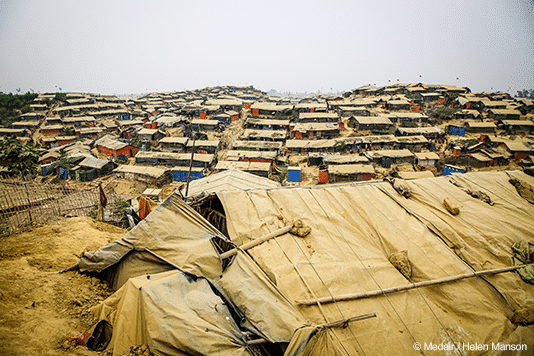 Located on the border with Bangladesh, they form the largest refugee camp in the world. From now on, promiscuity, malnutrition, family separation, monsoon floods are all realities that mark their daily lives. 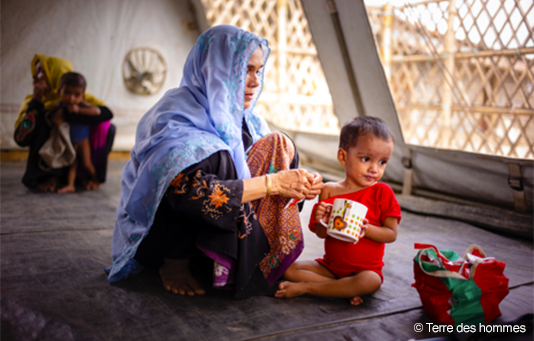 How do your donations help the Rohingya survive in the camp? Discover our Swiss partner NGOs’ actions, which we are financing thanks to you. Aggravated by the monsoon, health conditions in the camp are extremely precarious. How is access to healthcare being provided? 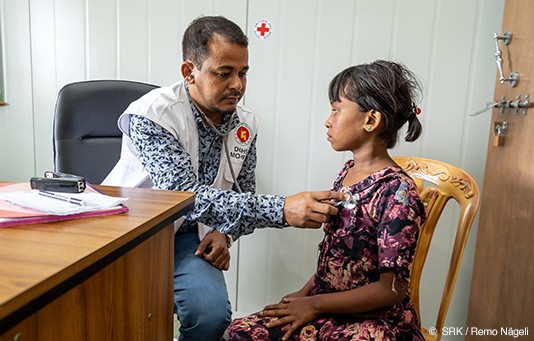 We are supporting the construction of three multidimensional health centres and a primary health centre, where the Rohingya are receiving basic healthcare and psychological support. Children, many suffering from malnutrition, are getting the help they need, and women are getting access to all necessary prenatal and postnatal services. Members of the community are being trained so that they too will be able to deliver some medical care. Cooking in shelters using wood as a fuel source carries a fire risk and contributes to deforestation. What’s more, walking long distances to fetch wood is especially complicated during the monsoon. 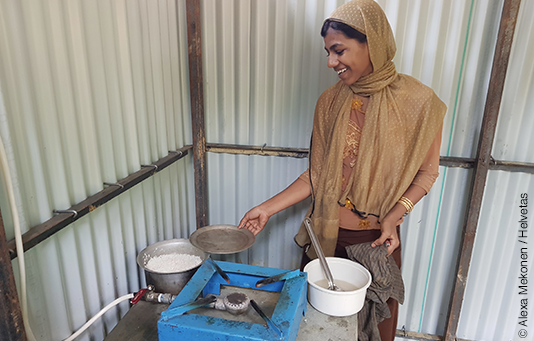 To enable the Rohingya to cook their food, we are funding the construction of community kitchens. Fuelled by gas or biogas from the latrines, these kitchens reduce the risk of fire and provide a safe place for women to congregate. The kitchens are equipped with handwashing facilities and promote sound hygiene and food handling practices. Rohingya families are living in temporary shelters within the camp, dwellings which can be swept away in an instant by landslides or floods caused by the monsoon. To enable the Rohingya to reinforce their shelters, we are supporting the distribution of construction kits containing materials such as tarps, bamboo poles, clamps and rope. The most vulnerable dwellings are also being identified. And refugees are also being trained to build stronger shelters so that they can in turn share their know-how with the community. How can the risk of spreading disease be reduced during the monsoon period? 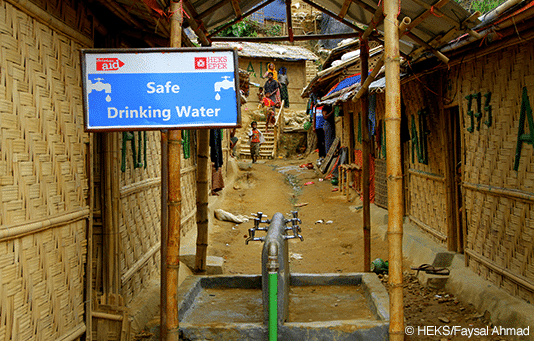 It is vital that overpopulated camps have access to drinking water and to wastewater evacuation and treatment systems. We are supporting the actions of our partner NGOs, which include promoting hygiene, distributing hygiene kits, maintaining latrines and securing access to drinking water. Household waste can also be eliminated safely now that rubbish bins have been located throughout the camp. 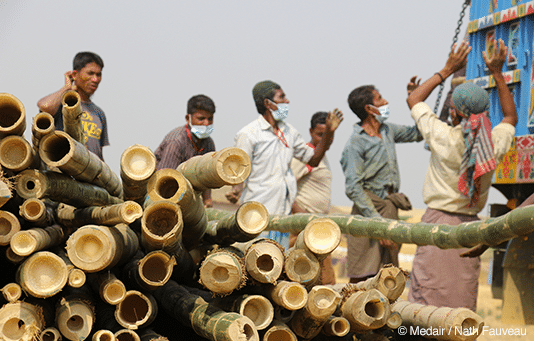 The Rohingya have been shown how to use the bins and manage the mud that builds up around the shelters. 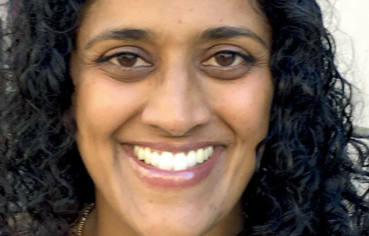 Manisha Thomas of the Emergency Appeals Alliance (EAA) recently visited a refugee camp in Bangladesh to get a sense of the monsoon preparations underway. Many Rohingya, particularly children, are vulnerable and could be traumatised by the violence which they have experienced or witnessed. We are supporting the implementation of two safe spaces where children are protected. Having access not only to healthcare and psychological assistance, but also to recreational spaces, is essential to these children and to those separated from their families. These spaces also offer women protection from violence and distress, as well as support groups they can join. Men are not forgotten either: they can play sports and receive psychological support. Where are the community kitchens? How does one treat a malnourished child? When will the shelter construction kits be distributed? According to Fabrice Junod, technical officer at Fondation Hirondelle, “Information goes hand-in-hand with emergency assistance.” Every day, 80 mobile loudspeakers are distributed throughout the camp, and information is broadcast so that the Rohingya can know how and when they will have access to the assistance they need. The recordings are made and edited by a team of Rohingya who have been trained for the task. We are supporting this project thanks to you.